Fantabulous Cricut Challenge Spring Flling- use the colors pink, green, yellow. 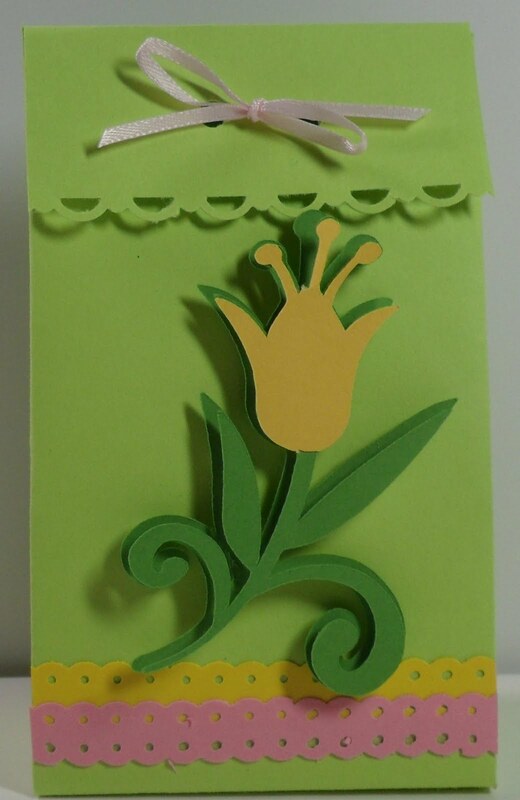 I'm stopping in to say hi -GREAT SPRING CARD--Hope you are having a great evening. This is a great treat box! I love that flower. Very pretty, Gloria, I love the flower too! Great card! Thanks for playing along with us at FCCB this week! This is so pretty! I love the different borders you've used. They add so much to the box. Great job! Hi Girlia I love your box and the colors match perfectly!!! Very pretty treat box the colors go well together! Great job on the challenge, thanks for playing along with us over at FCCB! I would love to have the directions for this. It is great. I make favors for the retirement center where my parents live for birthdays. I am always looking for simple favors since I have to make a lot. Thanks so much. Hi there is an award waiting on my blog for you! Enjoy your day! I love your box, it is so pretty!! Thanks for playing along with us at FCCB this week! Your treat box is just lovely! I am so glad you joined in our Spring Fling fun with us at FCCB!!! LOVE your treat box!! Thanks for joining us at FCCB! Hey Gloria! You won my Spring Fling giveaway! Wahoo! Please email me at raefinke at sbcglobal dot net to with your address. I will ship your April Showers cartridge to you asap! Your treat box reminds me of your header. Great colors.